Raging Owlbear has a blog entry up called Reavers of Harkenwold - Best of D&D 4e that shows how Marty Walser used Reavers of Harkenwood in his Nentir Vale campaign. The adventure is hidden inside the 4e DMs Kit. Marty says that he expanded The Duchy of Harkenwold from the adventure and was able to use it for a campaign that lasted months. 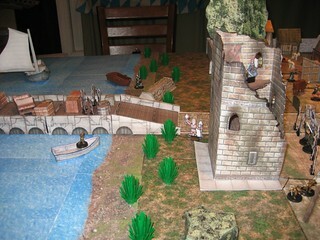 He has a few pictures of his miniatures in Harkenwold on his blog entry. I wonder if he is sitting on any cool NPCs he created for his expanded Harkenwood game. In one of his other articles, Marty said he used material from the Chaos Scar adventures to enhance its RoH campaign. If I ever get to play a RoH campaign, I will use material from the Longest Night (from Dragon 370, and printed in 4e's Dragon Annual) and Prey for Smiley Bob (a module from Dungeon 205). I have some ideas for tying RoH with the plot of Keep on the Shadowfell and Madness of Gardmore Abbey as well (and perhaps even Thunderspire Mountain). We are the truths? This world is at one with futility. Here are no truths. We steal from one another without glory. I'd be interested to see an outline of how you'd tie these adventures into a campaign. I have some ideas for tying RoH with the plot of Keep on the Shadowfell and Madness of Gardmore Abbey as well (and perhaps even Thunderspire Mountain). Yes, as Tim says, details, please! As for Thunderspire Mountain and Madness at Gardmore Abbey, those are fitting adventures to serve as sequels for a Keep on the Shadowfell campaign (yeah, Madness at Gardmore Abbey is way more fitting than Pyramid of Shadows... And way better, to boot). A DM may need to level up those adventures to make then fit as sequels of Reavers of Harkanwold, though. I'm going to have to go check out Prey for Smiley Bob. I like how your campaign outline features several factions that have various relationships with one another. I also read through a bunch of the 4E adventures recently, thinking about linking them together into a sandbox. I ended up with a Heroic tier campaign centered around Reavers of Harkenwold, then Thunderspire Mountain, then Gardmore Abbey. I was going to continue to link in Paragon and Epic tier adventures but I ran out of steam. First off, drop the level of the first part to level 1. 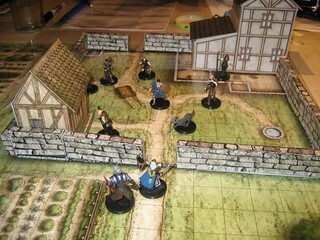 The opening encounter (the PC's encounter bandits attacking a homestead, help fight them off, and in doing so gain a reputation as strong warriors who can help save Harkenwold) works great as the opening to a campaign. And this lets us scatter level 1 Chaos Scar adventures around. Many years ago, Tor Hammerfist and his adventuring companions battled Zanandra, a black dragon that laired in the marsh that's now called the Toadwallow. They defeated the beast, but not before it bit off Tor's sword-hand. His adventuring career over, he retired to found Tor's Hold with the local woman who nursed him back to health. His companion, the goliath sorcerer Voran Earthmane, built a lab in the marsh where he could continue his arcane studies away from the prying eyes of the Harkenwolders while still being close to his friend Tor. Sturl Bransson, an aspiring bard, can tell the PC's this history, and will also add that "Great Uncle Voran" hasn't been seen since he was a child. If the PC's plan to venture into the Toadwallow, he will ask them to look for any sign of what happened to Voran and, if they can, recover his Staff of Earthen Might to keep as a heirloom and to use in Tor Hold's defense. He can give them directions to Voran's sanctuary. The PC's could also find this by following bullywug tracks or escaping bullywugs from the main lair. What he does not tell the PC's unless pressed is that he already made this request of another stranger. Yisarn the mage came to Tor's Hold a few months ago, just after the bullywugs began raiding, to ask about the story of Tor and the Dragon, and Sturl told him many details. He even showed Yisarn one of Voran's journals and recalls that the mage became excited over a mention of dragon's blood: Voran kept a sample of Zanandra's blood in his lab and traded another sample to the eladrin of Del Nystiere. Sturl became nervous about Yisarn's unhealthy interest and pretended he didn't know how to find Voran's sanctuary, and the mage vanished along with the journal and the dragon's tooth that used to be displayed over the fire (along with Tor's gilded hand, which remains). Everybody blames the stranger for the theft, but nobody knows how much Sturl told him about the dragon. It isn't hard to detect Sturl's guilt and convince him to unburden himself to someone outside his family. Yisam actually ventured into the Toadwallow caverns and made off with most of Zanandra's bones, but the bullywugs kept him from taking the skull. He was unable to find Voran's sanctuary, so he relocated to the ruins of Del Nystiere to search for the second blood sample and build up his power before making another try for the skull. The partially assembled skeleton in his workshop is specifically missing the head. Del Nystiere was not abandoned "hundreds of years ago", but a mere generation. People will strongly warn them away from the ruins, especially Reithann the Druid and the Woodsinger Elves. After Yisarn began threatening the Woodsingers a band of them ventured close to the ruins to try to root him out, and never returned. Now if the PC's attempt to explore the ruins directly they'll be ambushed by corrupted elves and led into an enchanted version of the forest with the ruined village and the evil spirit that lurks there at the center. If they fight through they'll find a back entrance to Yisarn's sanctum. The Woodsingers will tell the PC's about the standing stones and the need for dragon blood to activate them, but won't give up their precious supply unless the party impresses them mightily. Instead they will tell the party about a temple to Sehanine that stands on the outskirts of Del Nystiere that holds many secrets. (Finding it is a skill challenge; on failure the party blunders too close to the ruins and is ambushed by the Elves in the Valley, but can still find the temple if they aren't baited into following them.) The temple contains a door to a secret room that only opens under the light of the moon, and the last priest who took refuge there has an amulet with a drop of dragon blood obtained from Voran Earthmane. 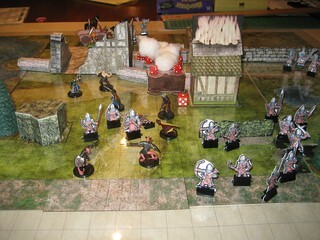 Of course, if the PC's are in the temple after sunset, Yisarn's undead horde attacks. The Iron Circle aren't the only bandits menacing the valley. A few lone groups are using their activities as cover for making trouble. One is a family of halflings named the Brothers Gray. The brothers sailed with the Reedfoots for a time but we're expelled for cheating landlubbers. Now they have a lair in an old mine in the Briar Hills, from which they emerge to rob and kill. One of the Reedfoot daughters might still receive letters from one of the Grays that hold clues to their hideout's location. Adalbar of Easthill will also complain that they are taking resources that could go towards fighting the Iron Circle and knows where to find them but can't attack them on his own. Iron Circle patrols in the area might complain about their ambushes and link them to the rebellion but don't know where to find them. Another family of halflings living near the White River are the Blackstream family, ex-traders who settled down on the riverbank to farm. Years ago, their eldest child vanished, and just recently the rest of their children were taken by slavers. The slavers have a lair in the forest to the northwest and, although they're not part of the Iron Circle, both groups support each other. The Reedfoots can tell the PC's this sorry history. The Den of the Slave-Takers contains a tunnel filled with Myconids, which is left open for the DM to determine where it goes. In this campaign it leads into the Underdark and eventually to Thunderspire. A lot of the other Chaos Scar adventures are linked into this tunnel. More on that later. Your plot is pretty good. I'm awaiting eagerly for the rest of your ideas. I can even add a 4th way to get the blood: ally with Cazzak (the dragon from the Longest Night, Dragon 370 - Roll vs Role section), and negotiate with with to get the blood. If you convice him you're going to help him to get rid og the Iron Circle problems, he can help you with a few drops of blood. You can even add the complications of using red dragon's blood instead of black dragon block if you really want to troll your players (though that's something I don't really like). Cazak is a Paragon Tier monster, so he can be your first step to built that expansion into the Paragon Tier. Likewise, Prey for Smiley Bob (Dungeon 205) is a really good adventuring to add to the halflings burdens. In the adventure, Smiley Bob is attacking the halflings because some goblins are harassing him, but you can change it to wathever enemy you like. The Briar Hills mine can be same Briar Hills mine in Some Assambly Required (Dungeon 208). Though the threat of the dracolich Kerang may be way too much for your campaign, you can connect the kobold tribes from this adventure to the ones from the Chaos Scar. This is why I love Nentir Vale, anyways. I'm going to try to answer with more details later, but I wanted to quickly note a few places from which I took inspiration. First, turning Reavers into a larger campaign started with going through all of the Dungeon PDFs during the 4e era. For the Harkenwold content, I borrowed heavily from the low level Dungeon adventures. The Chaos Scar adventures were often easy to modify since many were generic enough to occur anywhere. I focused on 1st through 6th level and compiled a list. I also went to milestone leveling (instead of XP), so the focus would become the adventure content and not the next level ding. My party's level progression did slow, but it also allowed us as a group the fun of enjoying the heroic tier over a long campaign. Having read a few different threads on Harkenwold, I stole a number of ideas to make the Battle of Albridge the key focus of the campaign. The Iron Circle has take Harken, but they don't yet have enough troops to hold all of the towns in the Duchy. However, they are bringing in more troops by the day, so this makes the recruitment aspect of the campaign critical. Getting Tor's Hold and the Elves to join became paramount. I also added the Halflings (river traders) as a faction with a village of their own. I don't recall the exact name, but there was an adventure called "Trouble at Misty River" or similar. I used that as the basis for getting help from the Halflings. There was also another poster who created a mass combat system that allowed each PC to lead a small unit of commandos that could contribute to the mass combat. I don't have those notes handy, but I modified his suggestions and came up with my own variation. Each unit had "hit points" which were functionally equivalent to 1 soldier per hit point. This gave the combat more gravity since with each skirmish, those "hit points" were the death of the village militia men and women. The players had a strong impetus to not just win, but to minimize losses since a victory with very few villagers left alive would be an empty one. There was even a combat medic mechanic that would allow healers to recover downed militia. Those "hit points" were still lost from the mass combat unit, but the NPC villagers might still be saved (post battle) by the medics. I'll look for my mass battle notes and post if I find them. They are generic enough that they could be used with any edition. 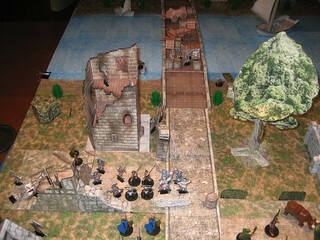 Prior to the Albridge battle, I also set up skirmish encounters for the PCs with the approaching army. Basically, these were hit-and-run scenarios to slow the march toward Albridge. The objective was not to engage the army in full, but just to slow down their advance units in order to buy time for the Alrbidge army to fortify. With all of these extra cogs and wheels I added in, I was able to really stretch out the Harkenwold arc over a much longer span of time. Granted, we were only meeting 2 or 3 times per month, but even with a weekly game, I could have gotten somewhere between 6 months to a year of content. All told, our game ran for 2 or 3 years and still stayed in the Heroic tier the entire time, which (for me) are the levels that work best in 4e. I'd like to replicate that campaign with a new group under 5e, but my group is currently in the middle of one of the hardback adventure paths. I enjoyed DM'ing that story immensely. Post Script: IIRC, I think I did use Smiley Bob as a pre-cursor to Harkenwold, but more as just a low level side trek. I don't recall everything I ran from Dungeon, but Misty River, Brothers Grey, and Stick in the Mud stand out in my mind. I also was considering making Marl the village that had been destroyed in The Slaying Stone, but the campaign ended up going a different way, so I scrapped that idea. Hi, welcome to the Piazza. Thanks for sharing this with us. Like you, during 4e I also used the milestone system to level up. Glad to see I'm not the only one who enjoys this system. I would love to see these mechanics, if you're able to dig them up. I've never quite found a mass combat system that suits my preferences. Something far simpler than what is generally offered (I don't care about formations or facing or learning a whole new mini-game), can use the existing core mechanics to simulate a battle at large scale, but isn't so zoomed in to the PCs as to make everything happening around them not matter. 13th Age comes close, but even that system still comes down to the PCs receiving boons or banes based on random chance that's thematically appropriate to the battle around them. Is this a formal system that's offered in the DMG or an issue of Dungeon or something? Or is it something that is pretty obvious to DMs, and you figured out the right number of milestones for your particular group and campaign? I don't remember from where I got the idea for this alternative rule. It's not on the DMGs. I guess it was from the old WtoC forums. But I really like it. It was a way to encourage roleplaying, and get rid of the XP, something I felt videogame-y. I guess I should share this alternative level up system. I'd love to see what you came up with and how close it is to the 5e optional rule and the 13th Age system for leveling up. I still have the DM kit from 4e, and I plan to run Reavers for a group using 5e rules soon. This is a group of teenagers who have played some, but they are still very new. I thought the "Robin Hood" story of Reavers would work well for a group of young players. I plan to have them all from the Barony of Harkenwold, having grown up together. They left the barony to see more of the Vale, but they decided to go back home for a visit, when they find the Iron Circle assaulting Ilyana. I hope to tie in the characters to various NPCs to make them care about what happens to the people and the area. I want to stretch the content to get them from level 1 to about level 5, at which point I want one of the characters to be given the title of Baron when the old Baron is too weak to recover from his time as a prisoner. Then they will have a keep and a barony to manage. It will be their job to protect their people from outside threats, which is a good opportunity to lead into other Nentir Vale adventures, like Thunderspire Labyrinth and Gardmore Abbey. I have gotten a lot of good info from this site, and I appreciate the admins approving me. If anyone has any other suggestions please let me know! Hi capnskillet7, and welcome to The Piazza! I like your idea for running Reavers as a Tier 1 adventure (or series of adventures). I think it'll work well in that way. Feel free to create a thread to keep us updated on your progress, especially as you convert content from 4e to 5e. You may not be alone in trying to do that, and it could be a help to others. Please consider saying hello in the Introduce yourself here thread, so we can get to know you better. Thanks for the welcome! I posted in the introduce yourself forum. I am not sure when I will be taking over DM duties of our little group. Right now one of the kids is acting as DM. He doesn't know the rules that well, but he is very creative and doing a nice job for a brand new DM. I hope when I run a campaign that all the players can learn the rules better and eventually all get a chance to be creative and run their own games in the future. I do not have any minis, but I do have the tokens from 4e. I will make a thread once my adventure starts and try to do writeups of what happens, including my adaptations to 5e and how well they work. Right now one of the kids is acting as DM. He doesn't know the rules that well, but he is very creative and doing a nice job for a brand new DM. Thank you for passing our hobby along to the next generation! I game with my kids as well, and am thankful that most of them enjoy it. Two of the teens in the game we are playing are students of mine. The other two attend church with them. Ironically, we play our sessions in the youth room at their church. It's a great thing that in rural Alabama, a church is okay with a group playing D&D in their building. Wow... I actually found the docs. I am such a digital pack rat. I modified the Mass Combat Rules from a post that I found on the Fat Dragon Forums. I can't find that post now, but I do want to credit the original author if anyone spots it. My version is definitely a derivative work. I'm pretty sure I heavily modified the mass combat rules from what they had posted. There are a couple vague areas. I don't remember how I handled "Zoom In" vs "Zoom Out". Zoom Out is the mass combat rules. Zoom In was more standard D&D 4e mechanics with individual combatant groups, but from what I remember, we didn't really "zoom in" much, if at all. I kept it really abstract. Each set of squads had a PC hero as the leader. That leader granted a power I made up based upon their class abilities. The PC is not otherwise represented statistically. They are considered part of the squad, and would be wounded somehow if their squads are routed. paper minis. A single paper mini will actually represent 3 units (i.e. – a 15 unit squad is 5 paper minis). For every 3 units lost, lie down 1 paper mini (representing a wounded soldier that may be “rescued”). in a square /rectangle when possible, but may be spread into a line in terrain-based squeeze situations. not provoke attacks of opportunity. reduces the opposing units by that amount. granted special powers that may be activated at any time to the benefit of a squad within 5 squares. Combat advantage may be obtained through use of higher ground, flanking or other situational effects. Combat Advantage grants only +1 for the purposes of this battle. positioning may require a ruling by the GM. defense number (also at GM discretion). “rescued” back to the rear area. “Zoom-In” battle that may be going poorly. PS -- My milestone leveling consisted of the following. 1) I put together my list of various modules that I had culled from Dungeon and other sources. 2) I ordered them by level. 3) We played through various adventures and side quests until I ran out of content for the level they were at or decided it was time for bigger foes. 4) I leveled them up. Very cool. Thanks for sharing this. I like that running mass combat would be quite familiar to anyone used to running the game. It's a scaled-up and simplified version of regular combat, rather than its own mini game. I prefer that. Does this mean the PC doesn't have access to their powers during mass combat? So if a wizard is embedded in a unit, they can't cast fireball against the opposing force while battle is zoomed out? I did exactly the same thing when running my 4e campaign for my kids! I still have the .txt file where I ranked the outline for the campaign, along with the level they'd reach when they completed each level's worth of adventures. Thanks for the information! This will be very helpful as I prepare content for a 5e version of these adventures. I would love to see that .txt file and the order you ran things. Right now I am trying to decide how often to level them up. I want them to reach level 5 at the end of Reavers of Harkenwold, but that is with adding in a few extra things along the way.